Laura is my youngest. From the time she was four or five she couldn’t go to sleep on Christmas Eve till way past her bedtime. Then she was awake before dawn because of her great excitement for the big day. As she got older, this sleepless pattern extended to include the nights before tryouts, and the nights before a big event like prom or a trip with dad. And then she got married in 2016, and so great was her anticipation after waiting until she was 31, I was afraid she wouldn’t sleep even five minutes on her wedding eve! But she did. A little anyway. Her bridesmaids spent the night with her here at our house, so I’m not sure it was quiet until the wee hours. My girl is an all-in girl who lives the moments of life to the fullest. Her sense of anticipation blooms fully as she nears something she’s really excited about. And I’m so glad she’s never outgrown her childhood enthusiasm. Her joie de vivre is infectious. My practicality is boring. Laura has taught me to be more expressive, to more fully engage in all of life. As a result, I’ve learned there is a great difference between just waiting around and waiting with great hope. Anticipation is watching with hope and expectancy. And it is indispensable to our faith! While we easily associate and practice this sense of expectation before Christmas, it’s rarely practiced with Easter. And yet because we know the end of the story— that Christ rose from the grave—we of all people should anticipate this day of celebration for our faith. Easter is the high point of all human history! In fact, as I wrote here, Easter is the holy day that ushers in our hope of being united with Jesus at the marriage supper of the Lamb. 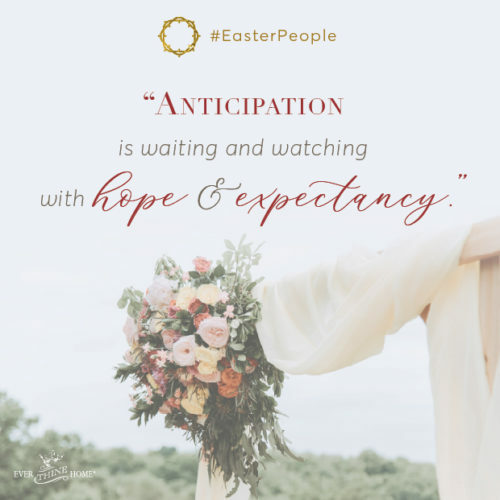 Just as Laura, and most other brides, eagerly, expectantly, and joyfully anticipate their wedding day so we as believers should practice and experience the same expectancy looking forward to Easter. It is our engagement party, the promise of His coming back for us to be His bride! PRAY: Ask God to clear away the fog of our we-know-the-story mindset so we can see afresh the stunning wonder of the Resurrection. INVITE: Ask the Holy Spirit to open your eyes, to see with wonder and awe the miracles of Easter for YOU, that Jesus died for YOU as if YOU were the only one. ENGAGE: Act as if you’d just been given an engagement ring from Jesus Himself, because you have! Don’t passively wait for God to do something spectacular. He already did on the cross! Your job is to get involved, spend some energy and time just as you would getting ready for a wedding, a birthday party, and of course Christmas. When we anticipate something important, we prepare to celebrate fully and exuberantly. 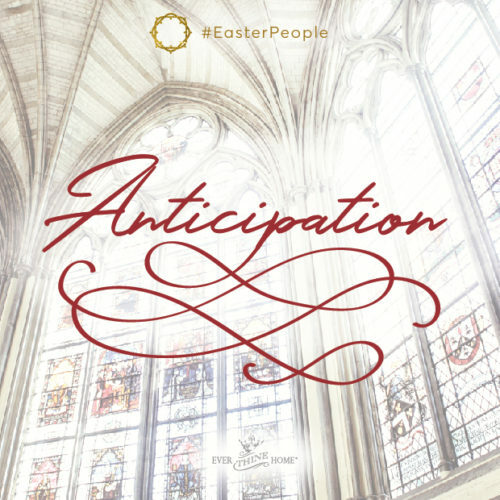 Unless you grow anticipation by investing in planning for Easter it will continue to be just another Sunday. So come on. Join us at Ever Thine Home in making much of Easter this year. 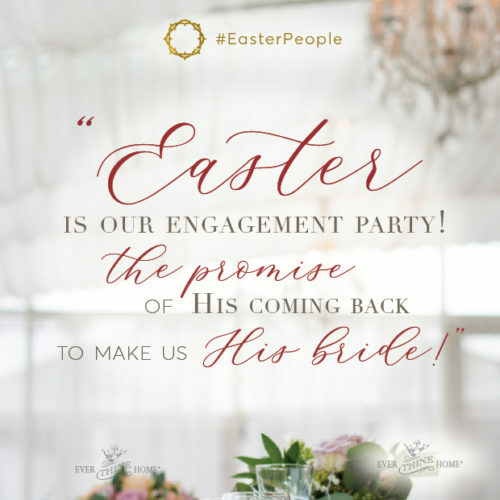 Decide to become #easterpeople with us! Start building anticipation in your home today and it might just deepen faith in each of your family members. And wouldn’t that be worth the effort?! This is truly a wonderful way to remember what Jesus did for us and we should celebrate Him everyday especially at Easter. We are to let the world know that He loves them and wants them to be part of His family. Beautiful video my heart is full of joy, can’t wait to share this with my church family and just maybe have a big party for Jesus on Ressurection Sunday. Thanks again and God bless you all. Love you Barbara Rainey for sharing your heart. Barbara Rainey, you rock! What a beautiful, meaningful, powerful legacy of glorifying God you’re creating for your family and those of us who absorb your influence! There’s nothing more powerful than the gospel, and it shines brightly in this devotion AND in the video! May God be pleased and bring many to Himself through your faithful, focused efforts! Thank you for helping us anticipate afresh this glorious holiday with your suggestions and decorations. We have the Lamb of God banner hanging in the kitchen and reading the daily 40 day devotional‘s for Lent. We have the Lamb of God banner hanging in the kitchen and we are reading the daily 40 day devotionals for Lent. Thank you for helping us anticipate afresh this glorious holiday with your decorations and prayers.